Ms. Vanderpool is Vice President at PRMS, Inc. in Arlington, Virginia. This ongoing column is dedicated to providing information to our readers on managing legal risks associated with medical practice. We invite questions from our readers. The answers are provided by PRMS, Inc. (www.prms.com), a manager of medical professional liability insurance programs with services that include risk management consultation, education and onsite risk management audits, and other resources to healthcare providers to help improve patient outcomes and reduce professional liability risk. The answers published in this column represent those of only one risk management consulting company. Other risk management consulting companies or insurance carriers may provide different advice, and readers should take this into consideration. The information in this column does not constitute legal advice. For legal advice, contact your personal attorney. Note: The information and recommendations in this article are applicable to physicians and other healthcare professionals so “clinician” is used to indicate all treatment team members. I hear about breaches of medical privacy and Health Insurance Portability and Accountability Act of 1996 (HIPAA) fines nearly every day. These breaches typically involve large organizations, presumably with large information technology (IT) staffs. I am a psychiatrist in solo practice with part-time front desk staff. I take my professional obligation to protect patient confidentiality seriously but often wonder how I can be expected to be held to the same standard as large organizations with all of their resources. Are you even covered by HIPAA? 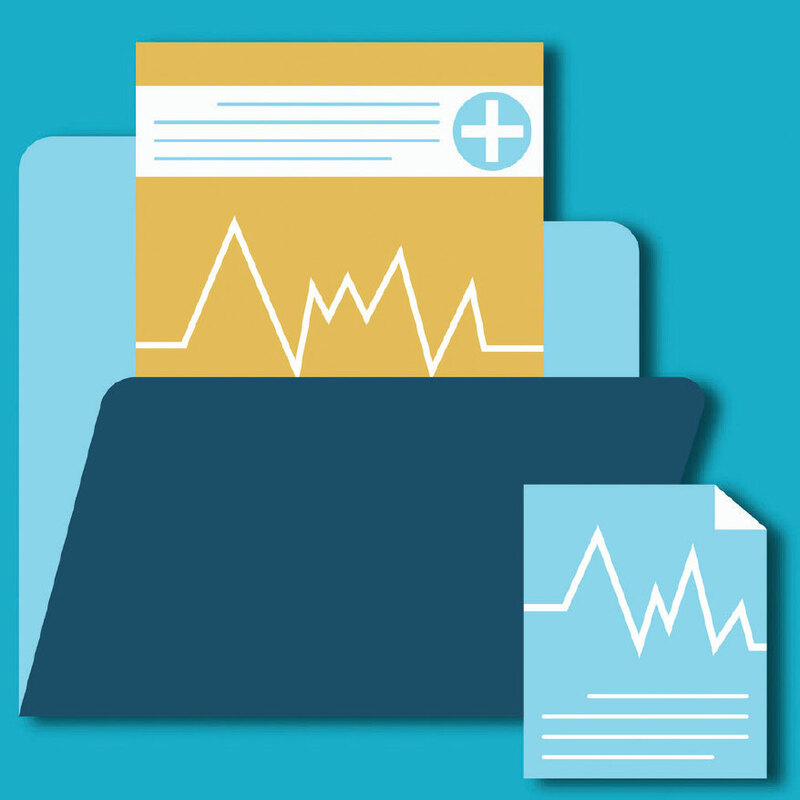 Coverage under HIPAA is triggered by specific transactions with health plans done electronically. Only “covered entities” are required to comply with HIPAA and thus are subject to the government’s enforcement of HIPAA. See Figure 1 and my prior article1 for more information on HIPAA’s applicability. However, even the entities that are not covered can have liability exposure for breach of confidentiality under the criminal provisions of HIPAA as well as under state law. • Allowing the filming of television shows in hospitals without patient authorization. In 2016, a New York hospital entered into a settlement agreement3 with OCR for $2.2 million for allowing ABC to film a television series “NY Med” in the hospital’s emergency department without the authorization of patients involved in the filming. The hospital was also sued by a patient’s family member who was horrified to see the death of their loved one on the show. Remarkably, two years later, three Boston hospitals entered a separate resolution agreement4 with OCR for $999,000. These hospitals also violated HIPAA by allowing television film crews on premises to film another ABC series, “Boston Med,” without patient authorization. • Allowing pharmaceutical sales representatives access to patient charts. A physician was arrested for, among other things, allowing drug reps to access patient charts and lying to federal investigators. The physician was convicted5 of one count of violating HIPAA and one count of obstructing an investigation. • Sending human immunodeficiency virus (HIV) information to a patient’s employer without patient authorization. A patient who had received HIV treatment from a facility submitted an authorization form from his office fax, directing records to be mailed to his home address or his personal P.O. box. Instead of doing as authorized, the facility staff faxed the complete medical record to the patient’s employer. The patient complained to OCR. OCR investigated and found that the same facility was responsible for a different patient’s medical record being impermissibly disclosed months prior, but had failed to address the vulnerabilities to prevent further breaches. The facility paid $387,000 to settle the case with OCR8 and was sued by the patient, who alleged negligence and negligent infliction of distress under state law. Criminals are interested in getting PHI. Reports of using malware to hold a provider’s ePHI for ransom are frequent. For more information on ransomware, see HHS’s “Fact Sheet: Ransomware and HIPAA”.9 While there are many ways for criminals to access systems with ePHI, one way at which they are particularly proficient is phishing, or the fraudulent practice of sending emails purporting to be from a reputable company to obtain personal information. Anthem, a larage insurance company, paid OCR $16 million in a record HIPAA settlement10 following the largest United States health data breach in history. PHI of close to 79 million individuals, including names and social security numbers, was stolen by cyber attackers. The criminals infiltrated Anthem’s system through spear phishing emails; at least one employee responded to a malicious email and opened the door to further attacks. In addition to impermissible disclosure of ePHI, OCR found other violations, including a failure to conduct an enterprise-wide risk analysis. OCR has developed specific guidance on phishing attacks11 and cyber security,12 including advice for small healthcare providers. Train all employees on HIPAA’s requirements, your policies and procedures, and the potential for harmful phishing emails. Document the initial and annual training, and consider having employees sign confidentiality agreements. Ensure you have business associateagreements (BAAs) from all of your business associates (BAs). HHS describes a BA as “a person or entity other than a member of the workforce of a covered entity, who performs functions or activities on behalf of, or provides certain services to, a covered entity that involve access by the business associate to protected health information.”14 Examples include, but are not limited to, answering services, billing services, and transcription services. Covered entities are required to enter into agreements (BAAs) with BAs to ensure that the BA will appropriately safeguard PHI. One physician group had to pay $500,000 to settle an OCR investigation15 that found the group failed to have a BAA with the group’s billing service. If you think there has been a breach of confidentiality, contact your risk manager or medical malpractice insurance carrier. Your insurance policy might include coverage related to HIPAA and other confidentiality violations. Vanderpool D. HIPAA—Should I be Worried? 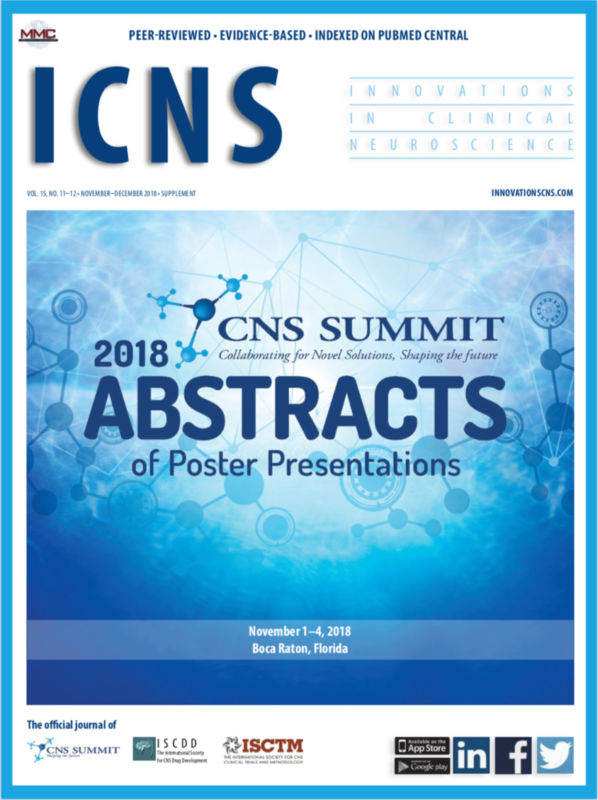 Innov Clin Neurosci. 2012;9(11–12):51–55. United States Department of Health & Human Services site. Summary of the HIPAA Security Rule. https://www.hhs.gov/hipaa/for-professionals/security/laws-regulations/index.html. Accessed 6 Feb 2019. United States Department of Health & Human Services site. Unauthorized filming for “NY Med” results in $2.2 million settlement with New York Presbyterian Hospital. https://www.hhs.gov/hipaa/for-professionals/compliance-enforcement/agreements/new-york-presbyterian-hospital/index.html. Accessed 6 Feb 2019. United States Department of Health & Human Services site. Unauthorized disclosure of patients’ protected health information during ABC television filming results in multiple HIPAA settlements totaling $999,000. https://www.hhs.gov/about/news/2018/09/20/unauthorized-disclosure-patients-protected-health-information-during-abc-filming.html. Accessed 6 Feb 2019. United States Department of Justice. Springfield doctor convicted by jury of illegally sharing patient medical files. https://www.justice.gov/usao-ma/pr/springfield-doctor-convicted-jury-illegally-sharing-patient-medical-files. Accessed 6 Feb 2019. United States Department of Health & Human Services site. Allergy practice pays $125,000 to settle doctor’s disclosure of patient information to a reporter. https://bit.ly/2Gr83Tr. Accessed 6 Feb 2019. U.S. Department of Health & Human Services site. Colorado hospital failed to terminate former employee’s access to electronic protected health information. https://bit.ly/2HUMzR2. Accessed 6 February 2019. U.S. Department of Health & Human Services site. Careless handling of HIV information jeopardizes patient’s privacy, costs entity $387k. https://www.hhs.gov/about/news/2017/05/23/careless-handling-hiv-information-costs-entity.html. Accessed 6 February 2019. U.S. Department of Health & Human Services. FACT SHEET: Ransomware and HIPAA. https://www.hhs.gov/sites/default/files/RansomwareFactSheet.pdf. Accessed 6 February 2019. U.S. Department of Health & Human Services site. Anthem Pays OCR $16 Million in Record HIPAA Settlement Following Largest U.S. Health Data Breach in History. https://www.hhs.gov/about/news/2018/10/15/anthem-pays-ocr-16-million-record-hipaa-settlement-following-largest-health-data-breach-history.html. Accessed 6 February 2019. U.S. Department of Health & Human Services. Phishing. https://www.hhs.gov/sites/default/files/cybersecurity-newsletter-february-2018.pdf Accessed 6 February 2019. U.S. Department of Health & Human Services site. Health Industry Cybersecurity Practices: Managing Threats and Protecting Patients. https://www.phe.gov/Preparedness/planning/405d/Pages/hic-practices.aspx. Accessed 6 February 2019. U.S. Department of Health & Human Services site. Five breaches add up to millions in settlement costs for entity that failed to heed HIPAA’s risk analysis and risk management rules https://www.hhs.gov/about/news/2018/02/01/five-breaches-add-millions-settlement-costs-entity-failed-heed-hipaa-s-risk-analysis-and-risk.html Accessed 6 February 2019. U.S. Department of Health & Human Services site. Business Associate Contracts. 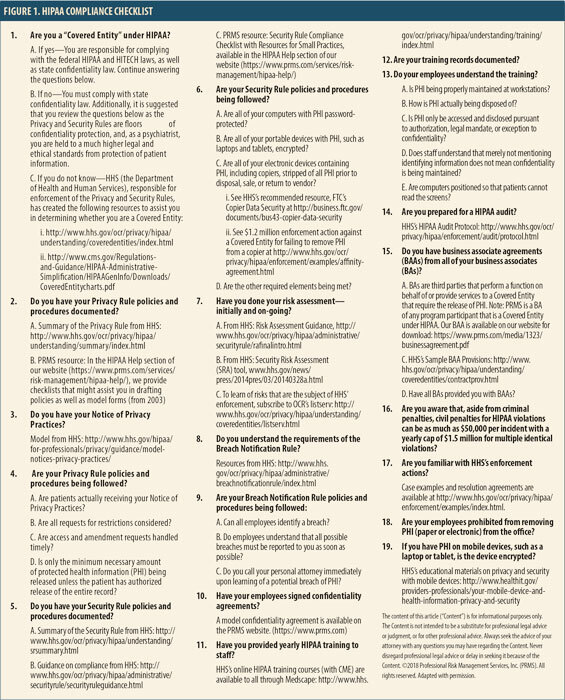 Sample business associate agreement provisions https://www.hhs.gov/hipaa/for-professionals/covered-entities/sample-business-associate-agreement-provisions/index.html. Accessed 6 February 2019. U.S. Department of Health & Human Services site. Florida contractor physicians’ group shares protected health information with unknown vendor without a business associate agreement. https://bit.ly/2HUNj8M. Accessed 6 February 2019. U.S. Department of Health & Human Services site. Judge rules in favor of OCR and requires a Texas cancer center to pay $4.3 million in penalties for HIPAA violations. https://bit.ly/2DXc9kI. Accessed 6 February 2019.